Coming of age picture book with fabulous illustrations brings the river to life. Nicky is not exactly thrilled to be sent off to his grandma's for the summer. He sulks and has a negative attitude, mainly because Grandma doesn't have a TV and lives out in the woods by a river. Little by little, Grandma (a self described river rat), wins him over by letting Nicky explore the river and get to know her better. She teaches him how to fish and when he rescues an old raft among the weeds and mud, the two spend afternoons together just floating down the river. This book, like "Night of the Moonjellies" by Mark Shasha, strikes a chord with its realistic portrayal of the bond that forms between grandparents and grandchildren. It's a coming of age story too, as Nicky arrives at Grandma's with a sour face but by the end of the summer learns a lot of new things about himself and is reluctant to leave. 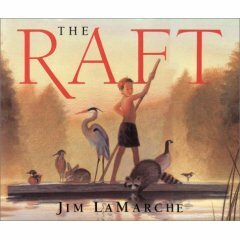 Jim LaMarche both wrote and illlustrated this book, based upon his own experiences as a kid growing up. His illustrations are stunning and we learn through this story the birth of his amazing artistic talent. If you have a young boy that likes to fish or draw, chances are he will enjoy this book. Our whole family (all girls) loves it and it really solidifies in our hearts a love for water and nature.